Tage Mahal was the debut album of Jon Oliva’s band called Pain and it was an album with huge Savatage influences. I was really looking forward to this gig as it was at least 5 years since I last saw Oliva on stage. The number of people turning up for this gig was absolutely disappointing, but it rather made it a “cosy” gig with a Jon Oliva playing in your living room feeling. The band of course consisted of the old Circle2Circle gang, featuring Matt LaPorte (guitar), Jerry Outlaw (guitar), John Zahner (keys), Jason Jennings (bass guitar) and Chris Kinder (drums). The Mountain King kicked off with Gutter Ballet and right from the start you could feel the magic in the air….. Jon’s voice was awesome and I know I was in for a treat this evening, as lots of Savatage killers were mixed with new songs from the TM album. 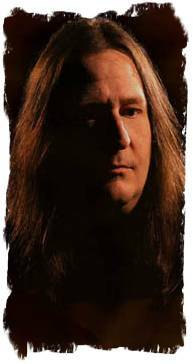 Even the first Savatage albums were not ignored as songs like Sirens, The Dungeons Are Calling and City Beneath The Surface filled the Bosuil venue. The first super highlights of this evening were outstanding versions of Hounds and Thorazine Shuffle. From my favourite Sava-album Streets, Jon picked the real gems, namely Jesus Saves, Tonight He Grins Again (really awesome), Believe (sung along by at least a 100 voices, including mine) and Ghost In The Ruins, in which Matt and Jerry fought out a real guitar duel with of course no real winner, except the audience. From the Tage Mahal CD Guardian Of Forever (Jon’s personal favourite), People Say, Gimme Some Hell and Father, Son, Holy Ghost (about the 9/11 attack) were the highlights. Encores: Power Of The Night and of course Hall Of The Mountain King. A great gig, people who have missed it really should be ashamed of themselves… Oliva rules like no other hard rock mountain King!! !